If you want the best views of Sedona’s iconic red rock formations combined with an easygoing trail ride and knowledgeable local guide, the Red Rock Range Tour has it all. Spectacular scenery and panoramic views are in store during this popular adventure hosted by Pink® Jeep® Tours. You’ll start at Pink® Jeep® Tour Plaza. Your Certified Interpretive Guide will meet you in an open-air Pink® Jeep® Wrangler that’s customized to provide the best possible views. You’ll then pass some of Sedona’s most recognizable red-rock formations while your guide shares facts and legends about the towering cliffs and spires. Next up: Thunder Mountain, one of the tallest summits in Sedona. Hear about Bob Bradshaw, photographer, movie scout and all around cowboy. Explore canyons and trails in your Jeep, all with a backdrop of unforgettable scenery and breathtaking vistas. There are no significant elevation changes on this tour, so it’s easy to sit back for a relaxing ride. Native landscape, wildlife and geological history add to the allure of the extraordinary, sweeping sights. The views are incredible and the memories will be unforgettable during the Red Rock Range Tour. This tranquil excursion is the perfect way to explore the desert Southwest with Pink® Jeep® Tours. Tour was fantastic with breathtaking views and Jen our tour guide was knowledgeable, friendly and made the trip very enjoyable. Tons of fun! The guide was informative and flexible. We got some bonus off-roading, which was awesome! I wish there was more of a description on the route of the red rock tour. 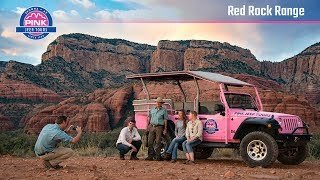 We were staying at the Sedona Rouge and we drove in traffic 20 mins to go to Pink Jeep to book, then back tracked in traffic pass our hotel and then again to return Pink Jeep. The bulk of our tour was on the 89 freeway. Bummer. The actual Red Rock part was nice. But spending half the tour on the freeway is a real bummer. I wish we booked another tour and the description was more clear. Our tour with Wayne was great. He was entertaining. Answered our questions. Great personality. He deserves a raise!! We had someone in our group who has some issues with arthritis, so wanted a tour that wasn't too bouncy, but not all on pavement either. This fit the bill.